There are many nutrients that are known to play a role with regards to bone health. Some of the most commonly recommended nutrients for people at risk of osteoporosis or osteopenia are calcium, magnesium and Vitamin D. Away from these three well-known – with regards to bone health – nutrients, there are many others that are known to be present in bones and have a role to play with regards to bone strength, these include vitamin K, manganese, fluoride, copper and zinc. It is this last mineral that we look at here. Zinc (Chemical symbol Zn; Atomic number 30) is a trace element that is chemically similar to magnesium. It is essential for many bodily functions including the immune response, reproduction, growth and development, and neurological roles. The element is known to interact with many other essential nutrients such as copper, iron, calcium, and vitamins A and B9 (Folic acid/Folate). Zinc acts as a cofactor for enzymes that are involved in protein and nucleic acid synthesis, and is known to play an important role in the bone remodeling cycle. Where it is involved as a cofactor for proteins involved in deposition and resorption of the bone matrix; plays a regulatory role; and is involved in the structure of the bone itself. Bone mineral hydroxyapatite crystals contain a complex of zinc and fluoride. There are many causes of bone mineral density loss (see prevention of osteoporosis) and it has been reported that one of the reasons for bone growth retardation is a zinc dietary deficiency. An investigation into the benefits of zinc intake in 3,000 people over the age of 60 (carried out in the USA) revealed that 75% of people did not consume the mineral at the recommended daily allowances. Further to this it has been reported that as people age they are less able to absorb nutrients as efficiently as younger people. The combination of these two factors can lead to a negative impact upon bone health. A combination of calcium, zinc (15 mg/d), manganese (2.5 mg/d) and copper (5mg/d) supplementation led to an increase in bone mineral density (+1.28) over the two-year study period. Other research has reported that patients who previously had had a femoral neck fracture improved their clinical outcome when given a dietary supplement that included essential nutrients, including zinc. Non-human experiments have revealed that β-alanyl-L-histidinato zinc prevented bone loss in rats via various mechanisms such as the stimulation of osteoblast proliferation; stimulation of calcification; and inhibition of bone resorbtion. The Food and Nutrition Board of the Institute of Medicine in the USA (FNB) recommend the following zinc RDAs. As over supplementation of the mineral (at 60 mg/d) can lead to copper deficiency the board has also set an upper limit of tolerable intake for use of the mineral. The Linus Pauling institute has set a RDA for zinc of 11 mg/d in adult men, and 8 mg/d in women. As most multi-vitamin supplements usually supply ~15 mg of zinc, it is easy to supplement the mineral into ones diet as a preventative measure against osteopenia and osteoporosis. 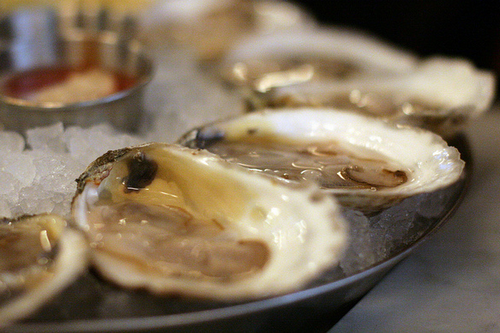 The most bioavailable form of zinc comes from meats, seafood and eggs. The reasons for the increased availability of the mineral in these zinc rich foods is that they contain the amino acids cysteine and methionine (which improves zinc absorption in the body); and have little to no compounds that inhibit zinc absorption. Oysters and are fantastic zinc rich food. Although Nuts, grains and legumes are a good source of the nutrient, they have less bioavailability of zinc due to the presence of absorption inhibiting phytic acid. As phytic acid can bind to minerals such as zinc, magnesium, and manganese, it is recommended that you eat products such as nuts, legumes and grains at a different time to when you are taking zinc supplements. Due to phytic acid meditated inhibition of zinc absorption it is recommended that vegetarians may benefit by increasing their dietary intake of the mineral by 50% if they are not taking supplements. The following information is based on information supplied by the USDA. In addition to its role in bone health, zinc benefits many important bodily functions and a deficiency of zinc (hypozincemia) in the diet is a risk factor that can lead to many diseases. Most cases of zinc deficiency are a result of low dietary intake, but hypozincemia can also occur through other factors such as diarrhea, malabsorption, diabetes, liver disease, and renal disease (amongst many others). It is estimated that between 25 and 33% of the world’s population is at risk from a zinc mineral deficiency. Some of the diseases and conditions that are a result of zinc deficiency include anorexia, cognitive impairment, decrease of testosterone levels in men, growth retardation, behavioral problems, impairment of the immune system, pneumonia, diarrhea, an increase in the susceptibility to infectious diseases (such as malaria in children), and pregnancy complications. As mentioned previously too much zinc in the diet (>60 mg/d) has been found to have an adverse effect and lead to a copper deficiency. Zinc toxicity at high single dosage levels (>225 mg) are known to induce vomiting. Other consequences of too much zinc include diarrhea, abdominal pain and nausea. The FNB recommends that the maximum tolerable level of zinc intakes in adults is 40 mg/d, so bear this in mind when taking zinc supplements. The commonest forms of supplementation come in the forms of zinc picolinate (widely promoted as the most absorbable form of the mineral despite the lack of scientific evidence in humans); zinc acetate; zinc gluconate; and zinc gluconate. Zinc is present in many foods, and meat, eggs and seafood are especially good sources. Although the mineral is present in nuts, legumes and grains, the presence of phytic acid leads to inhibition of its absorption. Vegetarians may benefit by increasing their consumption of the mineral by 50% over the zinc RDA or by taking a daily zinc supplement. High levels of zinc intake may lead to copper deficiency and therefore a maximum intake of 40 mg/d is recommended by the FNB in the USA. An adequate intake of zinc is considered very beneficial in both the prevention and treatment of osteoporosis.